Consumers crave the constant stream of content that emanates from social networks. It is one of the reasons they visit them with such frequency. For marketers, the job of sharing content is a never-ending task that requires a daily output of fresh information for their fans and followers to consume. 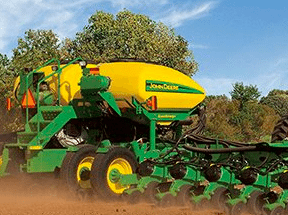 The challenge comes in finding sufficient amounts of high-quality material to meet consumer demand. Here are 10 sites that supply rich reserves of content and make the work of social sharing easier. Input keywords into Mention and receive an email alert each time the keywords are used. 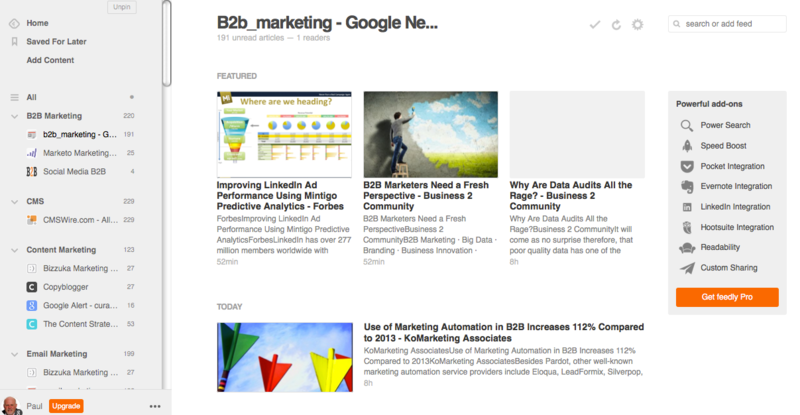 Mention is like Google Alerts on steroids. Subscribers create alerts (called “mentions”) using relevant keywords and receive notifications via email each time the keywords appear somewhere on the web. 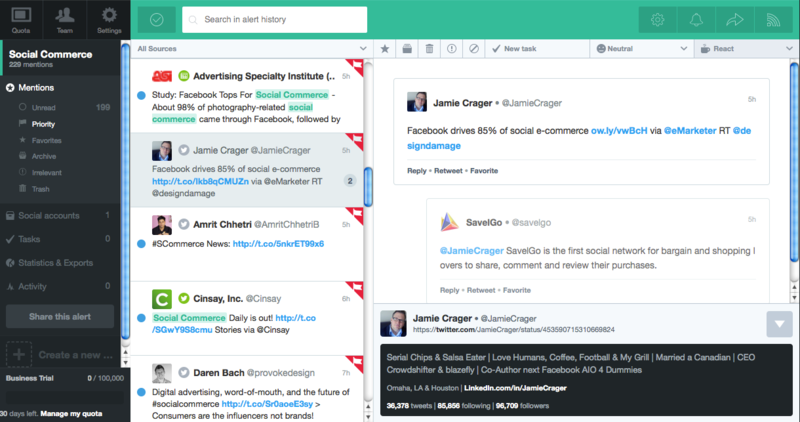 Users can connect social accounts to alerts and respond without ever leaving the application. They can retweet a mention, like or share mentions directly on Facebook, send mentions via email, or to a Buffer account for later posting. Mention is available for use on desktop and mobile. A free plan allows one user to create one alert. Premium plans start at $10 per month. Feedly is one of the most prominent RSS feed readers. Since the demise of Google Reader, use of RSS feed readers is not as fashionable as it once was. Feedly has risen to a place of prominence among readers that still exist. Though not quite as versatile as the now shuttered Google Reader, users can manage RSS feeds from sites they follow and search for topics via topically related hashtags. Feedly is free to use at the base level. A Pro plan is available for $5 per month that contains a number of upgrades including integration with LinkedIn, Evernote, HootSuite, Pocket, and other sites. A mobile version is also available. Pocket stores information for reading later on. 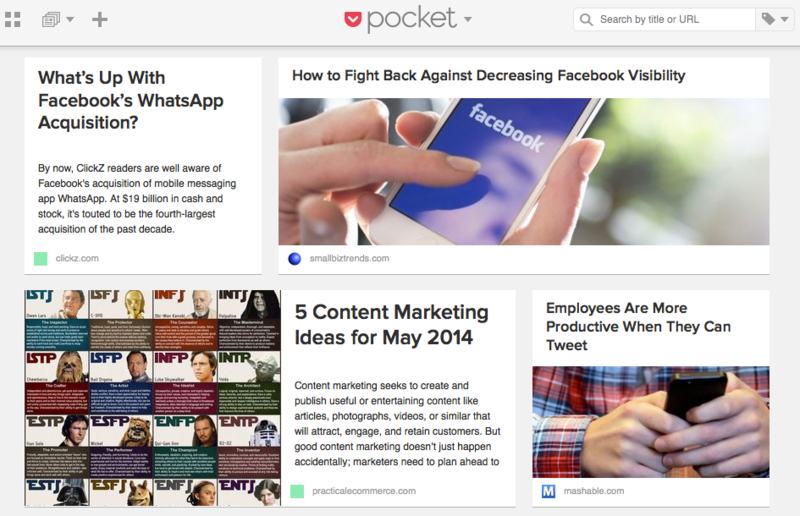 Pocket is not so much a source for finding content as it is for storing information to read later on. Users can save articles, videos, and other media directly from their browser or from apps like Twitter, Flipboard, Pulse, and Zite. Content saved to Pocket can be shared to Facebook, Twitter, or Buffer. 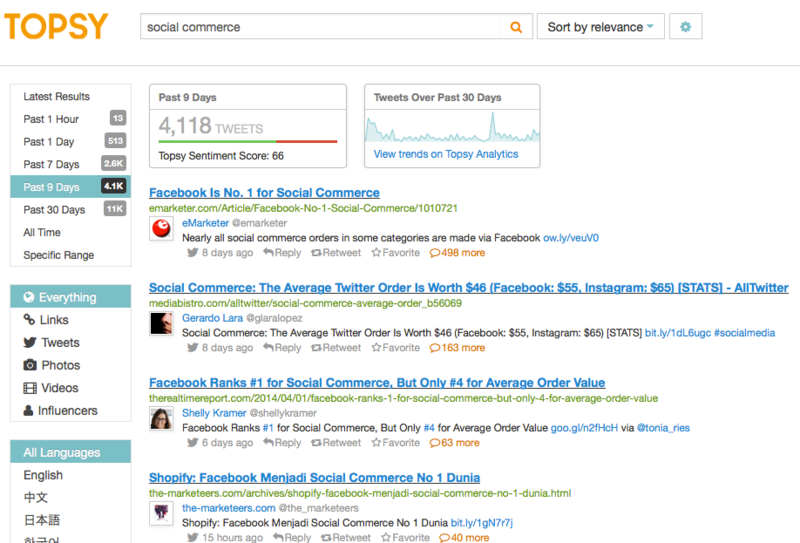 Topsy is a real-time search engine that mines social media for information. 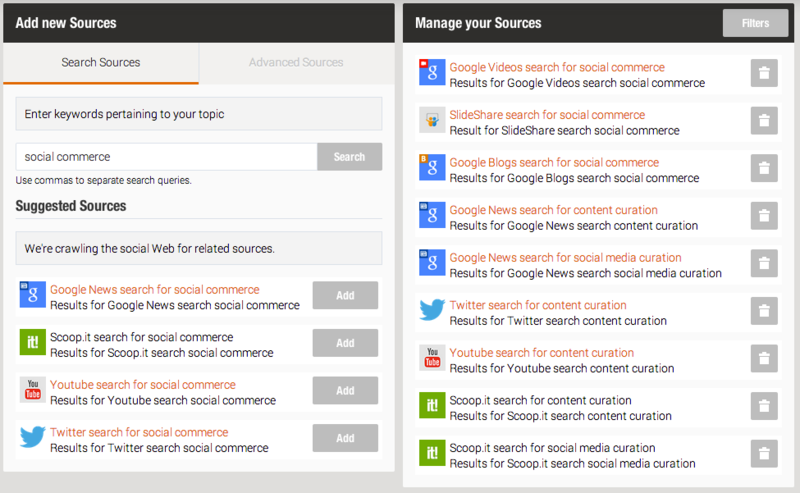 Topsy is a real-time search engine that finds content from within social media. Using keywords, searchers can discover information categorized by links, tweets, photos, videos, and influencers. Returns are ranked based on relevance, or by posting date (oldest, newest). Topsy also includes a social analytics engine that shows tweets per day based on keywords used in a search, and a social trends engine that lists the most popular topics being talked about at any one time. 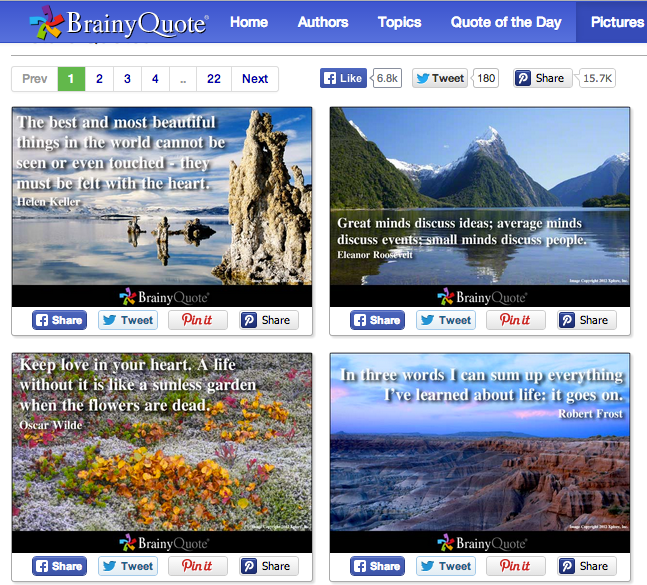 BrainyQuote is a popular resource to find quotes from famous authors. One favorite form of social updates is quotes, and one of the best places to find them is BrainyQuote. Users can locate quotes based on topics such as “Inspirational,” “Funny,” and “Family,” or browse quotes by famous authors. Picture quotes are available that can be shared to Facebook, Twitter, or Pinterest. Scoop.it is a content curation platform with a robust recommendation engine. Scoop.it’s main users are publishers who curate content around a given subject. However, its recommendation engine is a good source for finding resources to share on social media; anyone can make use of it. Enter a keyword and Scoop.it searches an extensive list of sources including Google (blogs, news, and video), Twitter, YouTube, SlideShare and more. SlideShare has slide presentations, PDFs, infographics, documents, and more. 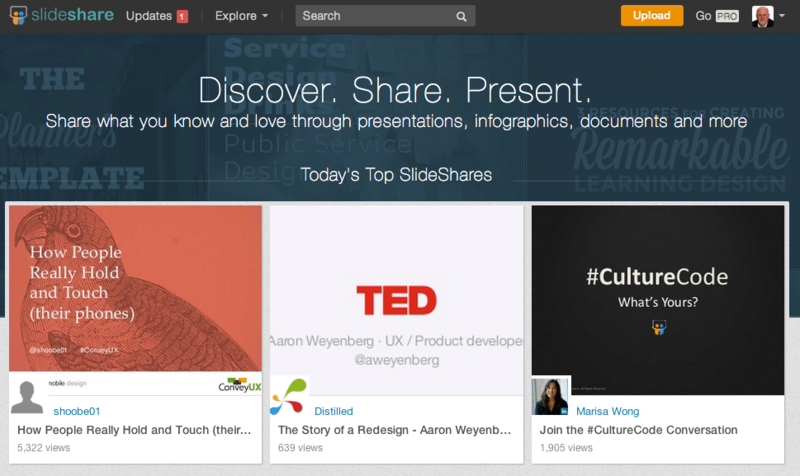 SlideShare is the world’s largest community for sharing presentations and other professional content. The site allows users to upload and share presentations, infographics, documents, videos, PDFs, and webinars. Visit the SlideShare home page to find the top trending presentations, as well as presentations categorized by topic, and those in vogue on social media. 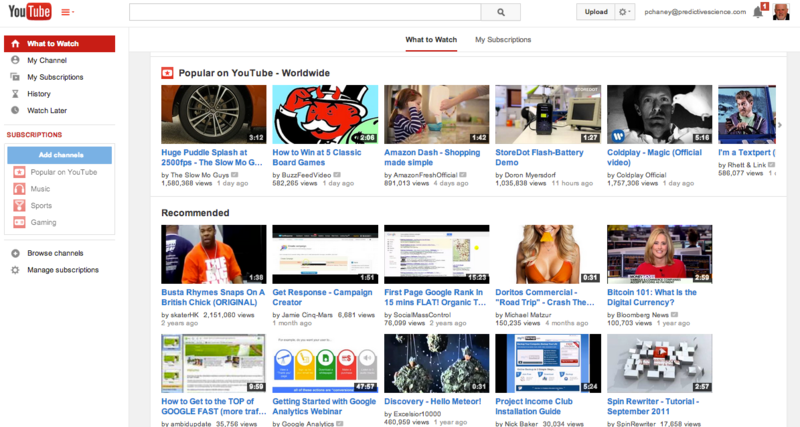 YouTube is the first place to visit to find informative and entertaining videos. YouTube is a source to find content about any topic. Similar sites include Vimeo, Daily Motion, and Blip.tv. Visual.ly is a resource for infographics on all sorts of topics. Infographics are a trendy form of social content and Visual.ly is a marketplace to find them. The comprehensive database includes both infographics and videos pertaining to a wide variety of topics including business, food, humor, how-to, and travel. SmartBrief newsletters contain summaries of current industry-related news. SmartBrief specializes in producing daily email newsletters that contain summaries of current industry-related news. 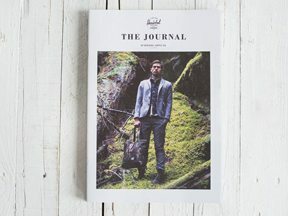 Subscriptions are free of charge, offered in partnership with more than 100 trade associations, professional societies, non-profits, and corporations. The resource is more relevant for B-to-B companies than B-to-C, however. There is a gold mine of information available on the social networks themselves. For example, Pinterest is a rich source for visual content that can be repinned or shared on other social networks. Facebook Page administrators can like other pages and share updates on their own timelines. Similarly, merchants can retweet posts from those they follow. Twitter lists are also a valuable source. Create lists of followers based on topics of interest.